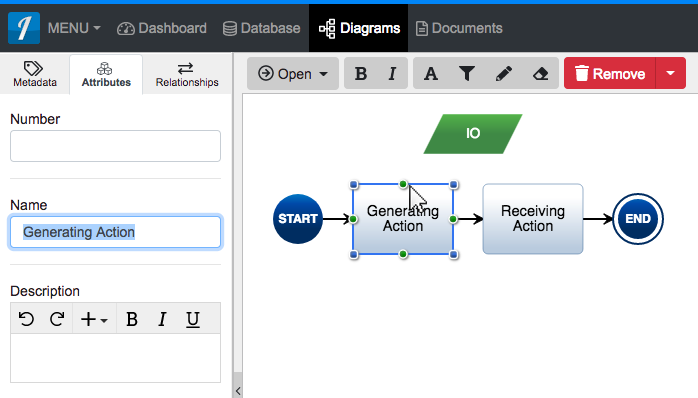 An 'Input/Output' construct can be added to an 'Action Diagram' via drag-and-drop. 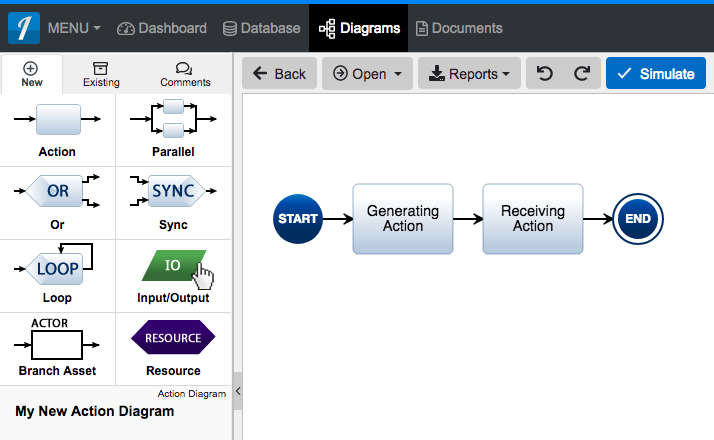 Within an 'Action Diagram,' click the 'Input/Output' icon in the 'New' tab of the left sidebar and continue to hold down the left mouse button. 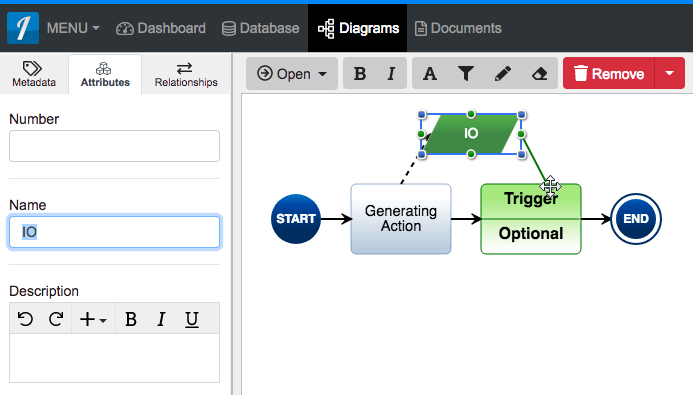 Drag the 'Input/Output' icon over to the adjacent diagram canvas. 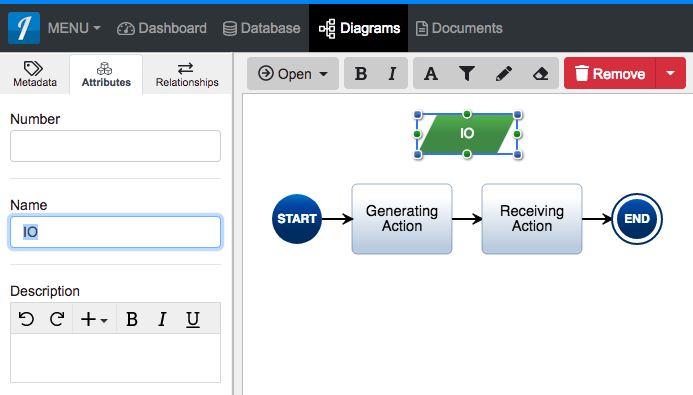 Release the left mouse button while over the diagram canvas to drop the new 'Input/Output' and add it to the diagram. Select the generating 'Action' construct, then click one of the green circles and continue to hold down the left mouse button. Drag the green circle to your newly created 'Input/Output' construct. When the 'Input/Output' highlights bright green, release the left mouse button to add a generated by/generates relationship. Select your newly created 'Input/Output' construct, then click one of the green circles and continue to hold down the left mouse button. Drag the green circle to the receiving 'Action' construct of your choice. When the receiving 'Action' highlights green, release the left mouse button to add the appropriate relationship. Releasing over the "Trigger" section will automatically add the received by/receives relationship with the Trigger relationship attribute set to "Yes," while releasing over the "Optional" section will automatically add the received by/receives relationship with the Trigger relationship attribute set to "No." Once added to the diagram with the proper relationship, enter a meaningful 'Name' for your new 'Input/Output' via the 'Attributes' tab of the left sidebar (focused automatically for convenience). 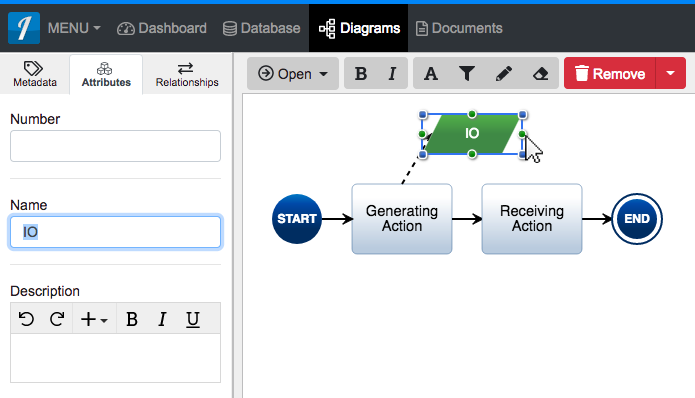 An ‘Input/Output’ construct can be added to an ‘Action Diagram‘ via drag-and-drop. Within an ‘Action Diagram,’ click the ‘Input/Output’ icon in the ‘New’ tab of the left sidebar and continue to hold down the left mouse button. 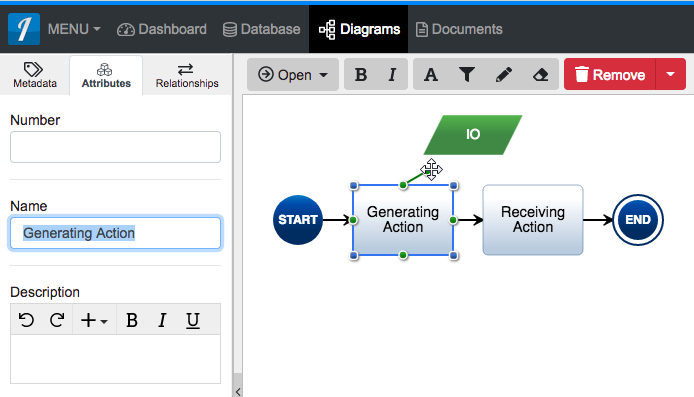 Drag the ‘Input/Output’ icon over to the adjacent diagram canvas. 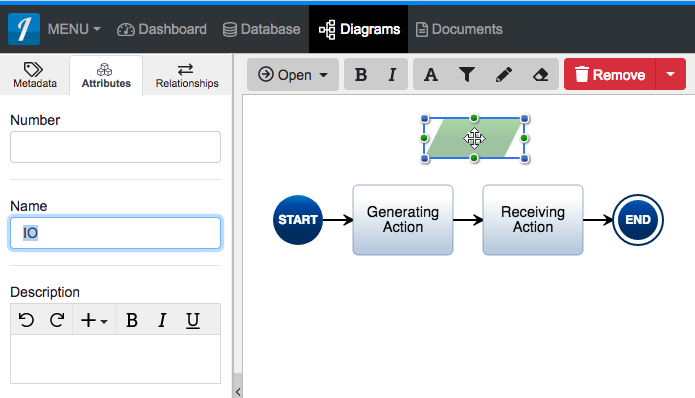 Release the left mouse button while over the diagram canvas to drop the new ‘Input/Output’ and add it to the diagram. 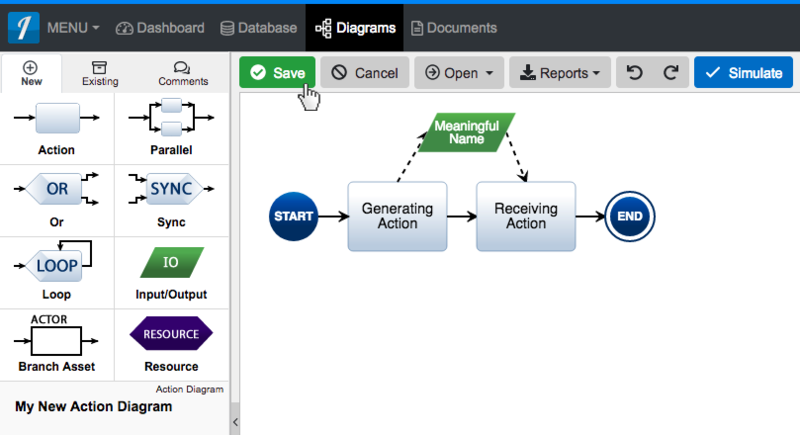 Select the generating ‘Action’ construct, then click one of the green circles and continue to hold down the left mouse button. Drag the green circle to your newly created ‘Input/Output’ construct. When the ‘Input/Output’ highlights bright green, release the left mouse button to add a generated by/generates relationship. Select your newly created ‘Input/Output’ construct, then click one of the green circles and continue to hold down the left mouse button. Drag the green circle to the receiving ‘Action’ construct of your choice. Once added to the diagram with the proper relationship, enter a meaningful ‘Name’ for your new ‘Input/Output’ via the ‘Attributes’ tab of the left sidebar (focused automatically for convenience).